A humble blacksmith’s son is thrust into a bloody war in the scrappy, ambitious Kingdom Come: Deliverance. 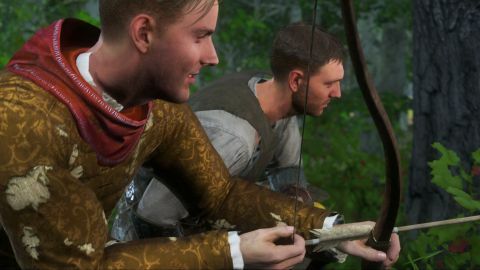 Bugs and performance issues aside, Kingdom Come is a seriously satisfying role-playing experience set in a rich, reactive world. What is it? An open-world RPG set in medieval Europe. The early hours of Kingdom Come are surprisingly peaceful. You help your father, the town blacksmith, at the forge. Run errands for your mother. Cause trouble with your mates. Flirt with your girlfriend. But just as you’re getting comfortable with protagonist Henry’s simple life, a mysterious army attacks the village, burns it down, and kills everyone he loves. This is the brutal flashpoint for the game’s epic tale of war, political turmoil, and vengeance, and I was genuinely devastated, and angry, when it happened. It helps that Henry is such a likeable hero. There isn’t much to him, but I think that’s the point. He’s so normal, so unassuming, that his presence provides a firm, relatable foundation for the story. As he reluctantly leaves his old life behind, becoming a page for a lord who takes a shine to him and finding himself on the frontline of a bloody war, he’s just as overwhelmed by everything as you are. But his spirit and determination keep his head mostly above the water, and he’s an effective guide through the complicated culture and politics of this harsh, unsympathetic medieval world. Kingdom Come is an RPG without the dungeons or dragons. There are no goblins, enchanted swords, or mages. You’ll never cast a spell, slay a vampire, or fulfil an ancient prophecy. And there’s something refreshing about how it trades these familiar fantasy tropes for something more understated and realistic. It’s by no means a perfectly accurate recreation of what life was actually like in the Middle Ages—Henry would probably die of dysentery or something in the first act if it was—but it does a good enough impression of one. The simulation that governs everything is impressively deep. If you get caught stealing, you’ll end up serving some time in jail. If you unsheathe your sword during a fist fight, your opponent will back down and maybe even apologise. Nobles will be more willing to speak to you if you’ve had a bath. If your reputation in a town is especially high, people on the street will shout your name and sing your praises. If you drink too much, you’ll wake up with a hangover. Take off your clunky plate armour and you’ll make less noise while sneaking. Eat rotten food and you’ll contract food poisoning. These little details keep piling up, layer upon layer, creating a world that is thrillingly dynamic and reactive. And this makes the game, at times, feel more like a Thief-style immersive sim than an RPG, letting you approach objectives in different ways, game the systems, and be creative. NPCs follow routines based on the time of day, which can be learned and exploited—particularly if you choose to pursue the thieves guild-style quests given to you by a shady character. It feels wrong turning the good-natured, God-fearing Henry into a light-fingered criminal, but it’s a great way to make some extra Groschen (gold, basically), which is in short supply for a lot of the game. One quest involves stealing something from a man’s house, and gives you an early taste of this reactivity. You can approach him during the day and simply ask to buy it, or you can sneak into his house at night and steal it while he sleeps. But he has dogs, and they’ll bark if they hear you creeping around, so you have to deal with them too—either by distracting them with some discarded meat or, if you can live with yourself, killing them as they sleep. But this might wake him up, and he won’t take kindly to you being on his property. And all of this is a product of the game’s rich, all-encompassing simulation, rather than a series of scripted events arranged by a designer. But this all comes at a cost. Like many games with this level of depth and ambition, Kingdom Come is plagued by bugs. The simulation is dense and complex, but also feels like it could collapse at any second. There’s relatively harmless stuff like characters getting stuck on walls or floating in mid-air in cutscenes. But sometimes it’s more severe, like the archery contest where my opponent refused to take his shot, trapping me in an endless limbo. Or the conversation that looped the same three lines of dialogue over and over, forever. Throw in some crashes to desktop and other janky weirdness, and you’re left with a game that sorely lacks polish. It doesn’t run very well either. Jarred has put together some benchmarks of Kingdom Come, but on a PC with a GTX 1080, an i5-6600K overclocked to 4.5GHz, and 16GB of RAM, I struggled to maintain a steady frame rate—even after significantly lowering the graphics settings and resolution. It’s mostly fine in the countryside, but as soon as I enter a town or anywhere with a lot of geometry, the game stutters badly and makes moving around feel sludgy and unpleasant. Which is a shame, because this beautiful, expansive stretch of medieval Europe deserves better. The forests in particular are stunning; deep and lush and mysterious, like stepping into another world. And while the setting isn’t as vivid or dramatic as more ostentatious fantasy worlds like Skyrim, Thedas, or Skellige, it feels more real than all of them. Another thing to note about Henry is that, while he can handle himself in a fight, he’s far from a master swordsman. Melee combat in Kingdom Come is weighty and violent, and every battle feels important. Make the slightest mistake and you’ll end up dead, which forces you to think carefully about each strike, block, parry, and feint. You can swing your weapon in five directions, and fights boil down to second-guessing your opponent’s next move and reacting accordingly. But it’s when you’re facing multiple enemies at once that things get really difficult, and I rarely survived an encounter with more than two foes, even thirty hours into the game. It doesn’t help that Henry is a fragile soul. In battle you’ll sustain injuries that will seriously hamper your ability to fight, and a bad one usually means you’re done for. You can improve your chances by wearing multiple layers of armour, but being draped in plate and chainmail has its drawbacks too, negatively impacting your stamina. And the ailments don’t stop there. Henry can get sick, tired, hungry, drunk, hungover, overfed, malnourished, and a dozen other status effects that will make him less handy in a fight. Keeping him fed, rested, and healthy is something that requires constant attention. Sleep in a bed and your injuries will heal, and if you own or are currently renting the bed from an innkeeper, the game will save. You can quicksave as well, but doing so requires bottles of expensive booze called Saviour Schnapps that have the unfortunate side effect of getting you drunk. Limiting saving to these two options is frustrating at times, but it does give your decisions more weight knowing you can’t just easily reload and try again. There are, thankfully, some mid-mission autosaves too, often before a difficult section. For those of us who prefer to avoid combat altogether, you can usually talk your way out of trouble. I spent the game honing Henry’s speech skill, which is improved by successfully convincing people to see your side of things in conversations. Similar to Oblivion, Henry learns by doing. So your horse-riding improves as you explore, your swordsmanship increases in battle, and your bow gets more accurate with every arrow that hits its target. I’ve always liked this levelling system, because it creates the illusion that Henry is slowly getting better at the things he does, rather than arbitrarily mastering them after amassing a certain number of experience points. A lot of modern RPGs diminish your agency by overusing map markers—something Kingdom Come deliberately avoids in its quest design. If you need to track someone down, it won’t mark their exact location on the map, just the town they live in. And it won’t mark the location of a bandit camp, but the swathe of forest it's hiding in. I can imagine this being frustrating for some people, as the marked area can be quite large and the directions vague. But I find it immensely satisfying, making me feel like I’m actually exploring and using my brain rather than blindly going wherever the developer tells me to. A good variety of quests keeps things interesting, from large battles and castle sieges, to more sedate activities such as hunting, settling disputes, and robbing wine cellars for drunken lords. There are also times when the game turns into an entertaining police procedural, and Henry proves to be a talented amateur detective, like some kind of medieval Poirot. The story can feel quite dry and and self-serious at times, but there are some fun, memorable quests including an encounter with a priest of questionable morality and an eventful hunting trip in the woods with the aforementioned wine-loving lord.